Birmingham Archives & Heritage has a large collection of material relating to the Theatre Royal, which opened in the 1770s on New Street (see The Iron Room’s recent blog post for more on the history of this theatre). 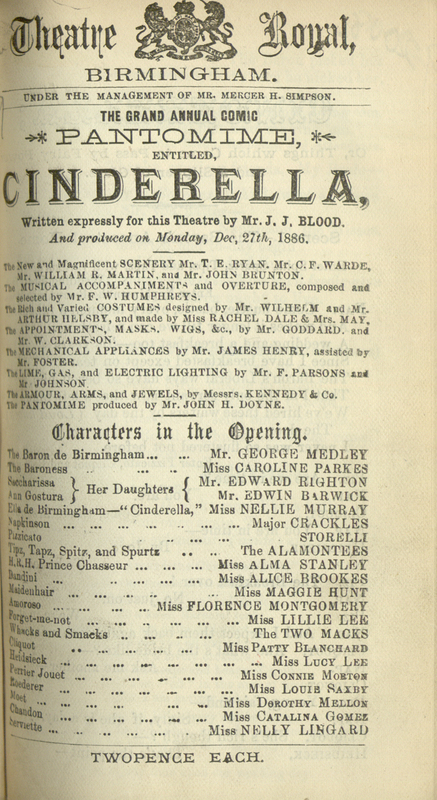 The run of pantomime texts in the collection reveals that Cinderella, one of the most popular and enduring of all pantomimes and arriving soon at the Birmingham Hippodrome, was performed at the Theatre Royal in 1886. Unlike pantomime today, which usually begins in mid-December and continues until the end of January, the 1886 performance didn’t begin until Boxing Day. Cinderella was played by Miss Nellie Murray, the Prince or ‘Principal Boy’ was played by Miss Alma Stanley and the Ugly Sisters, Sacharissa and Ann Gostura, were played by Mr Edward Righton and Mr Edwin Barwick. Other characters included Pizzicato, Forget-me-not and Whacks and Smacks. It’s not clear whether the 1886 show had any animals in the cast but every memorable pantomime should have one and this year’s performance at the Hippodrome will be no different! Seasons Greetings from all at the Children’s Lives project team and best wishes for 2012! We’ll be back in January with some new blog posts and we’ll begin the countdown to our exhibition, opening at Birmingham Museum & Art Gallery on March 24th, so we’ll have lots to tell you about!